Let’s celebrate with these free printable 4th of July coloring pages! Nothing beats coloring and this is why I create so many printable coloring pages. Kids can get very creative with them and in addition to that it has been proven that coloring has a very soothing effect . Consider it stress free therapy (don’t hesitate to do them yourself too). Independence day is pretty awesome if you ask me as not a lot of countries around the world have a celebration that is so patriotic. Little flags everywhere, food in the colors of the nation (crazy about cupcakes! ), fireworks you name it! I do hope I captured some of that spirit in this printable pack. 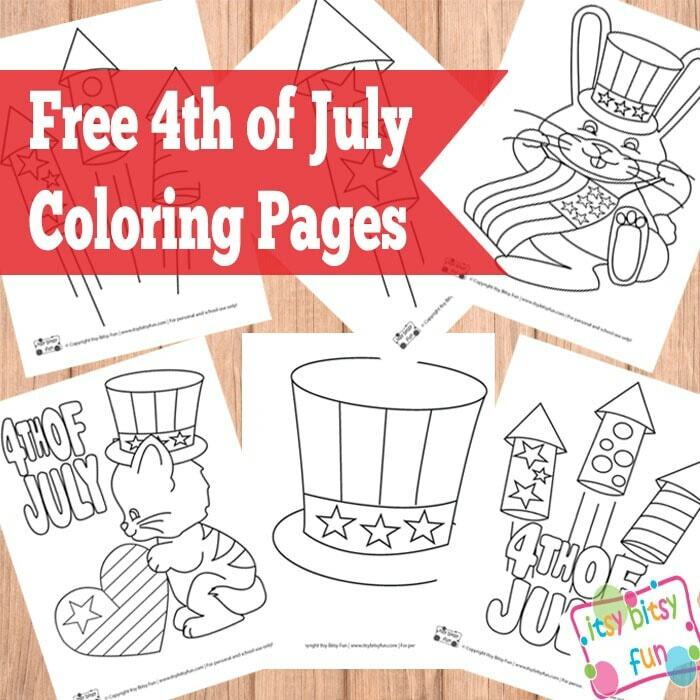 4th of July Coloring Pages for Coloring Fun! Perfect for keeping the kids busy while you prepare everything for the celebration. 4 easy pages with simple shapes. 4 more advanced pages with more detail and harder to color shapes. The patriotic cat is by far my favourite (can you tell I am a cat person?). Fireworks are pretty sweet too, well technically they are rockets. Get these free Independence Day Coloring Pages here.